Walkways (suitable for luggage trolleys) run between each level. Attendants are on hand at the end of each walkway for any passengers struggling to get their trolley off. Modern elevators/lifts connect each level. The ground floor is the departure point for the airport express bus service which runs to various points in Bangkok. Buses to the nearby Public Transportation Centre also leave from Level 1. 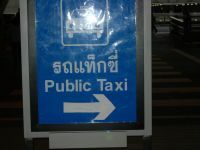 From the Public Transportation Centre, there are taxi services and onward connecting bus services to various parts of Bangkok and other provinces. Some limousine services depart from Level 1 and travellers on organised tours may also find that their transport picks them up from this level. Other services on Level 1 are the medical centre and the Thai restaurant favoured by airport staff. This is the floor for arrivals, both international and domestic. Arriving on an international flight, passengers must clear immigration before entering the baggage reclaim area. Please ensure you fill out a Thai Immigration Bureau Arrival Card. These are normally handed out on your plane before touchdown, but a supply is also held at the information desk before you begin to queue at immigration control. 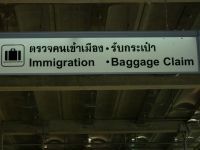 Even if you already have a Thai visa, you are still required to complete the arrivals card. Failure to do so is one of the main reasons for the long queues that can develop at immigration control. Once you’ve cleared immigration, collected your baggage and walked through customs, you go through the doors that lead into the arrivals hall. This is where you will almost certainly be asked if you want a taxi. The people doing the asking will be smartly dressed and carry official looking badges. They are representatives of limousine companies who will charge you a higher fare than normal to get you to your hotel. Once you ask one for a price, you will usually attract the attention of numerous others. If you want to catch the normal public taxi, ignore all of these apparently helpful individuals and head for the official public taxi rank located outside on Level 2 (by entrance door number 4). As with the taxi touts, be wary of anybody approaching you offering airport services or information no matter how genuine they themselves may appear. Go to the appropriate official counter to be certain. This floor offers the most choice in terms of food and drink. As well as Thai, Chinese and Japanese food, there is an S & P Bakery, Black Canyon Coffee, Starbucks and the Miracle Food Village. Whether you fancy a green curry, a mango shake or an espresso, Level 3 has it covered. As well as food and drink, Level 3 also has a hairdressing salon and a foot massage salon. TMB Bank and Siam Commercial Bank both offer exchange facilities as well as ATMs. This is the floor for departures, both domestic and international. Looking at the airport from the front, domestic departures are on the left-hand side and international on the right-hand side. There are a number of banks offering exchange and ATM facilities. There is also a Boots pharmacy, a Family Mart shop and a book store. Arriving at the airport by taxi, you will be dropped off at Level 4. Check-in for domestic flights is area A-F. 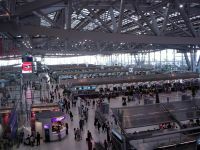 Please note that it is quite a lengthy walk from the check-in desk to the actual departure gate particularly for the budget carriers like Air Asia so allow yourself plenty of time. Air Asia, Bangkok Airways, Nok Air, One-Two-Go and Thai Airways all have ‘buy and fly’ counters where you can purchase tickets. Note also that most of the budget/low-cost airlines have weight restrictions on baggage which are more strictly enforced than they used to be. Typical baggage allowance is one checked bag of 15kg and one item of hand luggage (maximum 7kg). See relevant company website for more details. If your bags are over the limit you will be required to pay an excess fee which normally means filling out a form and going to the appropriate desk before returning to check-in. As with the domestic departures, it can be quite a lengthy walk to the actual departure gate for international flights. In addition to this, the queues to clear passport control can be quite lengthy. My personal recommendation is to arrive at the airport at least 3 hours before your international flight leaves and head for passport control as soon as you’ve checked in rather than hang around. There are plenty of eating, drinking and shopping facilities airside once you are through passport control. Sky Loft and Sky Lounge dining.